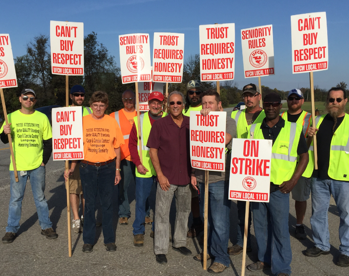 This month, after standing together to improve working conditions, Jim Beam workers in Clermont and Boston, Ky., ratified a new contract by a vote of 204 to 19. The workers are members of UFCW Local 111D. “Today’s vote is the culmination of the efforts of many to reach a compromise that will, ultimately, benefit everyone. After months of negotiation and feeling like the voice of UFCW 111D was not being heard, we had hoped that we would not have to go on strike to reach an agreement with Beam Suntory management. In the end, we made a strong statement and we were heard. “The final proposal includes many of the key elements that we felt so strongly about, such as equal pay for equal work, a cap on temporary employees and the hiring of more full-time employees. We appreciate management’s diligence to reach an agreement with the union. They met with employees from a cross section of departments from both the Clermont and Boston plants, and representatives talked to employees on the picket line to clarify the areas of greatest need.